Quite possibly the ultimate low voltage alarm for R/C gliders, this new design of mine is extremely light and uses very little power. 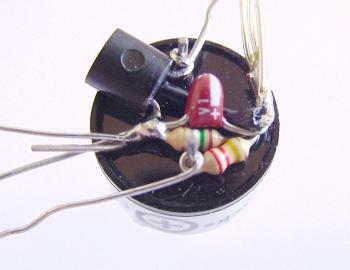 All up weight with a two-inch wire pigtail is 0.07oz (2gm). When quiet, this circuit uses minimal power (less than 0.01 mA), and uses about 2mA when sounding. The design uses a total of five parts, requiring four solder joints, and NO CIRCUIT BOARD (you could make one, but it would be way overkill). Design notes: This design uses an integrated circuit (IC) mounted in a package that looks like a regular small signal transistor, a plastic “TO-92” case. The IC has a precision tuned voltage reference, voltage divider resistors, a comparator, and an output driver that can sink 50mA. This product was designed to monitor the voltage of an onboard battery, such as those of cordless phone handsets, or to monitor the supply voltage of a microprocessor. The hysteresis built into the chip means that the circuit turns on (ON in the table below) at a lower voltage than it turns off (OFF in the table below), typically a 0.05 volt difference for this particular IC, but the extra components I’ve added here expand the hysteresis to about 0.2 volts. This circuit was originally set up for a three cell receiver battery pack in my Spectre HLG that at the moment has four HS-50 servos, a Hitec 555 receiver, and uses 110mA three cell battery packs. With this configuration, the battery voltage dips a bit every time the servos move (and even more so with smaller capacity batteries), so the alarm would go off every time the servos moved if there were no filter capacitor (C1) added. The IC has an extremely fast response rate, so the resistor divider and the capacitor were needed to make the response rate very slow--on the order of a half second. If the alarm is on more than it is off, either I've been stirring the sticks like mad, or it's time for a fresh battery. 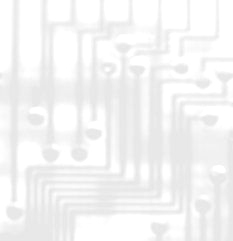 Options: The resistors divide the battery voltage and provide a test voltage to the IC. The table below gives other values for R1 and R2 that would be appropriate for a several battery pack cell counts and plane types. For hand launch gliders (HLG), the flying is close by with small capacity packs, and I want to use the very last few electrons from the pack, so the alarm sounds at a lower voltage (ON voltage below) at about 1.1 volts/cell, within 1-2 minutes of the pack being completely dead. With slope or thermal duration ships, I’d like a little more warning, so the alarm voltage threshold is higher at about 1.15 volts/cell. The capacitor filters out the bumps in the voltage level. With smaller capacity batteries, the voltage drops more with servo motion than it does with larger capacity batteries, so the capacitor needs to be a little larger with a smaller capacity pack. Also, more filtering out the bumps with a larger capacitor means that the alarm sounds further along in the discharge cycle of the battery. If you find that the alarm sounds with every servo motion even with a generous charge left on the battery, try increasing the value of the capacitor a bit (you can solder another one in parallel alongside the first). The table below gives sample values for each application, but you may like to adjust some for your particular plane and tastes. 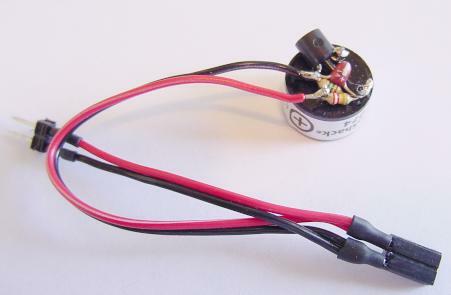 The piezo buzzer is a self-contained device that features a tiny driver circuit already inside the device. The smaller of the two listed below and available at RadioShack is tiny and light, but not very loud. For TD or slope ships, I recommend a larger buzzer, like the second RadioShack unit below. Building: Wrap together the leads of C1 and R2, then one side of R1 as shown in the pictures. Then add the leads of L1. I used a short length of heat shrink tubing over the middle lead of L1, but a short length of insulation stripped from a bit of servo wire will fit over the lead also. After a test fit on the buzzer, solder the leads together off the buzzer. Wrap L1 and R1 leads to the posts of the buzzer, being sure to get the polarity of the buzzer right. Solder the buzzer leads. Add and solder the connector leads. I wrapped the thing with some clear shrink tubing as a final cover, but some tape will work. If you are using this with a 5 channel receiver and 4 servos, you will need to rig some kind of Y-connector as in the pictures below. Installing: Solder on a battery connector or servo connector with positive and negative as shown, and plug the connector into an unused slot in your receiver. In my Spectre HLG, I used a piece of double sided (carpet) tape to fix it to the inside of the fuse pod directly over a tiny hole in the side of the fuse to maximize the sound reaching the outside. 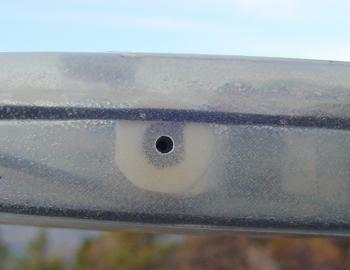 I’ve found that gluing the unit, facing down, to the inside of the fuse under the rear wing mount over an appropriately sized hole in the fuse works great and is out of the way for TD or slope ships. Testing: You definitely need to test this gizmo with your particular ship, partly to make sure everything is connected properly, but also to imprint your mind with the sound it makes. With a HLG, I usually fly the battery to the end every time I fly the plane, so I am listening for the alarm. On my slope and TD ships though, it is extremely rare to get to the very dregs of the battery—either the battery was not charged properly, or the battery is no longer functioning properly. I end up flying R/C a couple times a week, but such a ”battery empty” event is so rare with slope and TD ships that when it happens and the alarm goes off, I find myself thinking, “What the $%&* is that noise?” rather than thinking “I’ve got to land this thing RIGHT NOW,” or “Time to charge before I launch again.” So far, I’ve salvaged two full house TD ships with this sort of alarm (faulty batteries), but could not figure out in the wind and cold why my slope ship was suddenly making such a racket (forgot to charge) before I lost control and watched it crash. Install the device in your plane, then run down the battery by twiddling the sticks, and see how the system behaves. You will probably run down your battery much faster this way by stirring the sticks than you would ordinarily, and can expect to see the alarm going off with maybe a third or less of the time you would expect to be able to fly, unless you just twitch the sticks now and then like you would when you are actually flying your plane. If you have a voltmeter attached, you will also notice that you can drive the voltage down quite a bit by continuously stirring the sticks, particulary with a six servo ship, but that the voltage will recover when the servos are not moving. In the field then, you can do a quick sort of battery check before you launch just by stirring the sticks a few times, thus putting a load on the system and observing the result. As described above, here are the values for several battery pack cell counts and applications: hand launch glider (HLG), thermal duration (TD), and slope. Digikey (1-800-344-4539) part numbers: Digikey does sell the peizo buzzers, but they are much more expensive than those at Radio Shack and are larger as well. There are several manufactures of the voltage dectectors in the Digikey catalog and each offers at least several voltage ranges--this one happened to be the voltage I needed. In addition to shipping, there is a $5 processing charge if your order is less than $25. 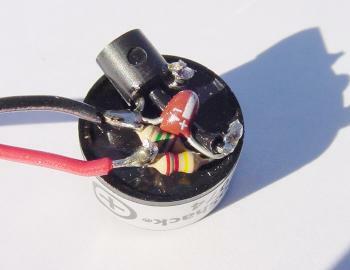 Tantalum capacitors are physically smaller, but any composition will work. The tantalum capacitors are polarized—at the small voltages used here the polarity probably does not matter, but if you think of it, solder it in with the “+” in the direction outlined in the drawing above. 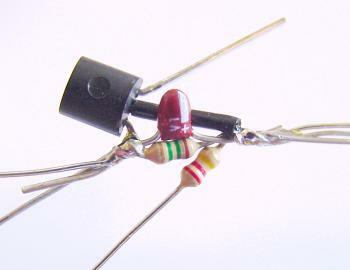 The 1/8 watt resistors were the smallest I could find without going to a surface mount type resistor, but any power rating will work as the current involved is extremely small. Radio Shack (1-800-843-7422) parts: You can visit your local store, call, or order on the web.